Stresses, temperature changes, and other physical parameters can often affect ray trajectories, either by deforming the geometry of the domain or affecting the refractive indices within the domains. Similarly, high-powered rays can generate significant heat sources that affect the temperature field and may cause notable thermal stresses. 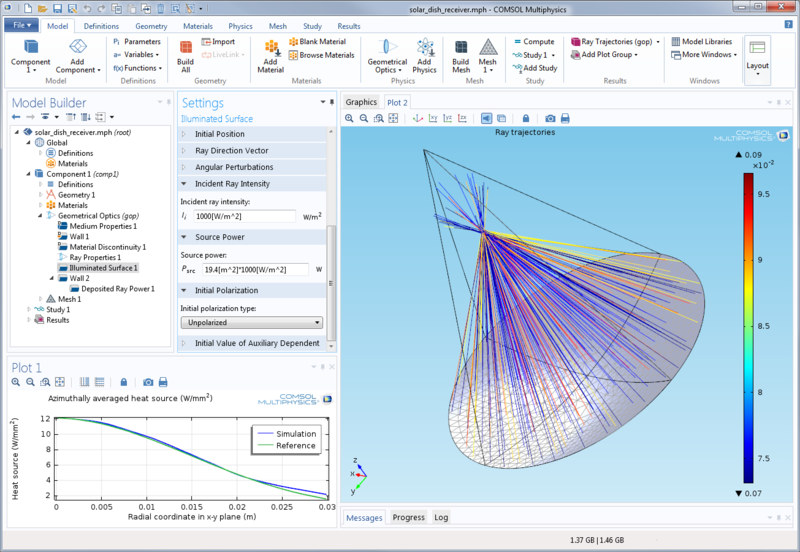 The Ray Optics Module is fully capable of simulating such multiphysics applications. 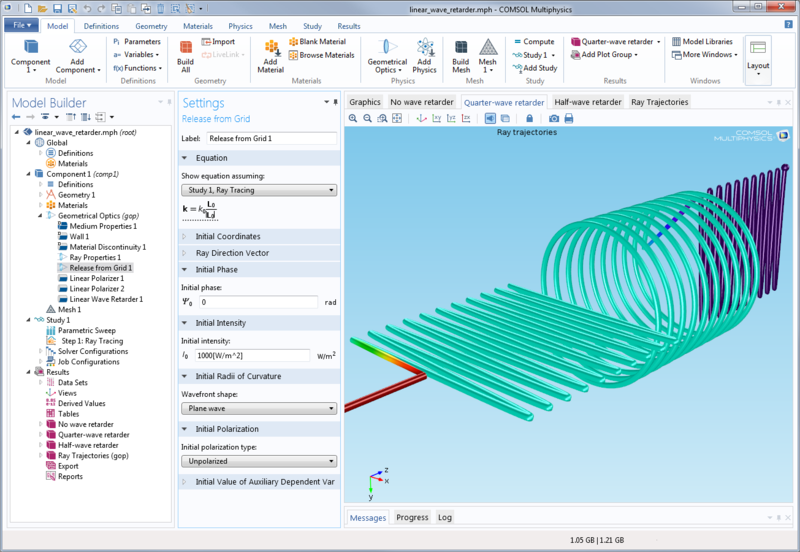 Accumulator features on domains and boundaries can be used to create dependent variables that store information about the rays in the corresponding domain or boundary mesh elements. Specialized versions of these features for computing deposited ray power in domains due to ray attenuation or at boundaries due to ray absorption are also available. Using these Accumulator features, it is possible to set up unidirectional or bidirectional couplings between the ray trajectories and the dependent variables created by other physics interfaces. This can be used, for example, to create self-consistent models of thermal lensing effects. 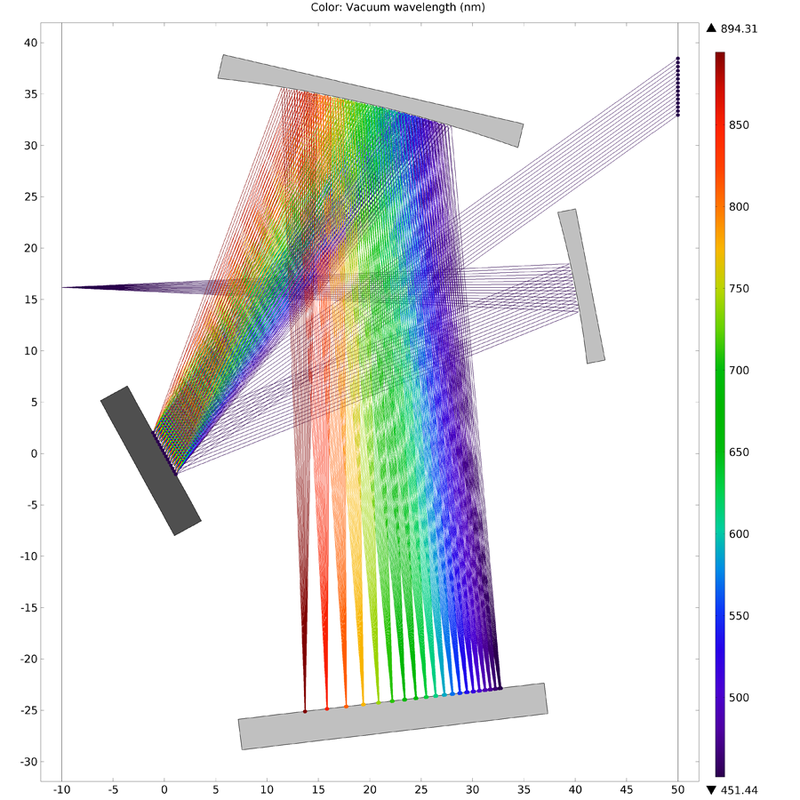 You can visualize rays using the Ray Trajectories plot, to which a color expression or a deformation can be added. This can be used, for example, to deform polarized rays to visualize the instantaneous electric field amplitude. The Ray plot enables the plotting of a ray property versus time for all rays or two ray properties against each other at a specific set of time steps. With the Interference pattern plot, you can observe the interference of polarized rays that intersect a cut plane. Other postprocessing tools include the Ray Evaluation feature for generating tables of numerical data, the Poincaré map (spot diagram) for observing the intersection of ray trajectories with a plane, and the Phase Portrait for plotting two variables against each other for all rays as points in phase space. Built into the Ray Optics Module is a specialized interface for modeling ray propagation, known as the Geometrical Optics physics interface. The Geometrical Optics interface includes optional variables for computing ray intensity using the Stokes parameters, enabling the modeling of polarized, partially polarized, or unpolarized radiation. The polarization can be changed at boundaries using boundary conditions for common optical components, such as linear polarizers and wave retarders. When computing the intensity, the rays are treated as wavefronts for which the principal radii of curvature are computed, allowing caustic surfaces to be visualized with ease. At boundaries between media, the reflection and transmission coefficients are computed using the Fresnel equations, with the option to apply corrections based on the presence of thin dielectric films. When the instantaneous electric field is of interest, as in interferometers, a variable for phase can be activated. Other physics interface settings can be used to enable the calculation of optical path length, allow rays to be released with a frequency distribution, and improve the accuracy of ray trajectories in absorbing media. Although the ray trajectories are computed in the time domain, it is not always necessary to specify a list of the time steps. The Ray Tracing study step can be used to solve for the ray trajectories by directly specifying the desired range of optical path lengths. The study can be made more efficient by using built-in stop conditions to terminate the time-dependent solver if all rays have left the modeling domain or if the remaining rays have negligibly small intensity, preventing the solver from taking unnecessary time steps.